And how three people who helped build it were impacted by organ donation. The organ donation process is fraught with complex emotions. Potential recipients and their families want a new organ, but that usually means someone in relatively good health has to die for the organs to become available. 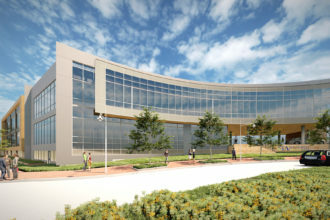 Many people have known that tension, including the team that came together to build Southwest Transplant Alliance’s new facility. The bittersweet moment that often accompanies an organ donation occurred just a few months later for McDonald, when a coworker in his 40s named Dale Browning tragically passed away, leaving behind a wife and two young daughters. The family came to the firm where McDonald worked, and spoke about their commitment to organ donation. “What are the chances?” Matt thought. Browning was a match for McDonald’s father, and in just a few days, he had a new kidney. McDonald is now a principal at Corgan. He met Patti Niles, president and CEO of Southwest Transplant Alliance, at a leadership meeting. He shared the story of his father’s kidney with her. In a fortuitous moment, STA was in the process of expanding its organ recovery services with the hopes of building a first-of-its kind facility where potential donors could be brought in order to efficiently remove organs for donation. 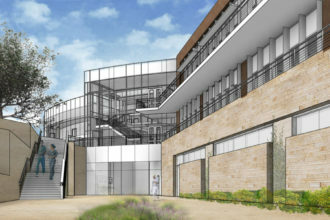 The 77,000 square-foot facility will feature operating rooms, a memorial garden, and office space. As the plans for the 77,000-square-foot facility took shape, STA chose Cushman and Wakefield to manage the construction process, with Senior Project Manager Kyle Bramlett running the show. The organ donation powers-that-be had aligned another partner with a meaningful transplant connection. Bramlett grew up in Forney, and the Joneses, who lived down the street, were like a second family for him. Bramlett would live with two of the brothers, Casey and Corby after college. While Bramlett was living with the elder Jones brothers, the youngest brother Clay was a sophomore in high school. During Clay’s football practice in August 1995, as his coach attempted to get the team indoors, lightning struck nearby, knocking the whole team down. Clay didn’t get back up. CareFlight took him to Baylor Medical Center in Dallas, where Bramlett and Clay’s brothers met the rest of the family. Two days later, Clay was taken off life support. “We envision this as a place where, if the donor families want to meet the recipients later on, they can come and do it in a very respectful, loving environment,” Niles says. The new facility is more than just a new building. By providing a centralized organ donation location, the organization can save what can be thousands of miles and dozens of hours of driving or flying time for the removal team. When a potential donor dies, the team often has to act quickly; the heart, for example, has only four to six hours to be salvaged. The center will have a six-bed holding area similar to an ICU and a five-bed operating room. There will also be a space for families who have just lost a loved one to be together in comfort, complete with a memorial garden for the donors. “We envision this as a place where, if the donor families want to meet the recipients later on, they can come and do it in a very respectful, loving environment,” Niles says. It is expected to be complete late this year. Six years ago, STA was part of 700 transplants, but this year, that number is up to 1,300. The new facility will improve efficiency, but for McDonald, Bramlett, and Niles, coming together to complete the project is about giving families a way to find hope in sorrow, and life in death.